When George Bruce bought the land at the corner of Canal and Lafayette Streets (then known as Elm Street) in 1832, the area was still mainly industrial. The waterway that had run down the center of Canal Street, giving it its name, had been covered over in 1821 leaving an especially wide thoroughfare. Here Bruce, who was more well-known as a printer and typographer, erected a lumber mill that operated for over two decades. The inventive and ambitious Scotsman had come to the United States before he was 15 years old. By the time he built his mill he was highly-regarded in the printing industry and deeply involved in the education and training of working-class men and boys. The tone of Canal Street was changing in 1855, with more refined commercial buildings being constructed, when a raging fire destroyed the mill and adjoining buildings and the fury of the blaze at one point threatened the entire block. Rather than rebuild his mill, Bruce opted to erect a loft building to house his printing concern. Having invented a new form of mechanical type-casting and stereotype methods Bruce had already amassed a fortune. Gambling on Canal Street’s future as a commercial center, he envisioned a large structure with three separate stores on the lower floors and loft space above. In the meantime, James Bogardus—who had also been involved in the printing industry--had been making his mark on the New York architectural scene. 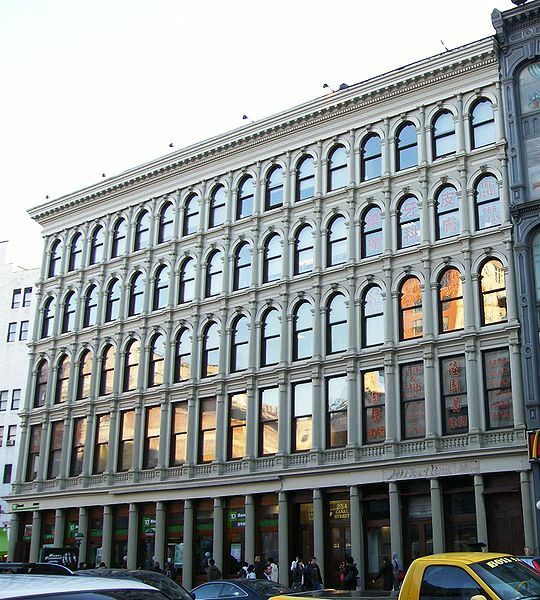 The cast iron facades which he designed, produced and installed, were groundbreaking in affording rapid construction, relatively inexpensive and ornate designs, and incombustible material. With the fire that wiped out his lumber mill fresh in Bruce’s mind, the concept of a fire-proof building had great appeal. The building was home to Charles Scott & Co. in the 1860s, importers of embroideries and “white goods” and in the 1880’s wholesale tobacco dealers Wise and Bendheim were here. In December 1910 the building was auctioned with 22 other properties comprising George Bruce’s estate. Having made what The New York Times reported were “wise investments in real estate,” Bruce left property with an estimated value of between $2 and $3 million. By the middle of the century 254 Canal Street, along with its surroundings, had declined. When Nathan Wilson purchased the building in 1948 from Moe Levy & Son, it was a manufacturing loft with various shops on the ground floor. In the early 1980’s the ground floor was essentially covered over by slapped-on storefronts and the all but one of the wooden doorways were replaced by modern glass and metal entranceways. Metal flashing covered much of the first floor cornice. 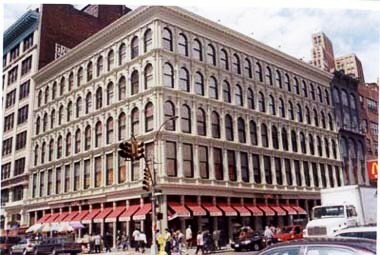 Indeed, today the largest surviving James Bogardus building in New York City shines again. Like many of the Canal Street structures, it has been restored to its 19th Century appearance, including the once-lost street level.